"It is something to worry about. It is tough. But we have long spikes, we have spikes to hopefully keep our footing better on the field. But the field, it is what you see. It's pretty nasty out there. I don't know, that gives us an advantage - when teams come from playing on turf to playing on grass, I guess that slows them down a little bit more than it slows us down." That quote is a month old. Despite what Garcon said, the conditions didn't particularly favor the home team yesterday. The Seahawks, used to playing on always-solid, never-slippery FieldTurf, had two players suffer leg injuries on the day—kicker Steven Hauschka slipped and hurt his ankle and couldn't handle kickoff duties, while DE Chris Clemons lost his footing and left with what's believed to be a torn ACL. (Clemons's agent blamed it on the "crappy" field.) The Redskins lost two of their own. Guard Kory Lichtensteiger aggravated an ankle injury in the first quarter, and Robert Griffin III, their quarterback, their franchise player who came into the game with a brace and a gimpy knee and would still need to scramble if Washington had any hope of staying alive, ended up sprawled in the muck. Griffin tweaked his knee early, but might have survived had been able to plant his leg on a muffed snap in the fourth. Instead his spikes refused to grip, his leg shot out at a grotesque and unnatural angle, and that was that. FedEx Field, which hadn't seen rain in days, claimed a season in an inexplicable quagmire. Here are some Redskins' reactions to the condition of the grass. "It's the same thing we've been dealing with for the last eight weeks at home," fullback Darrel Young said. "Nothing different than what it has been," running back Alfred Morris said. Asked if they were worse than usual, Reed Doughty cocked an eyebrow. 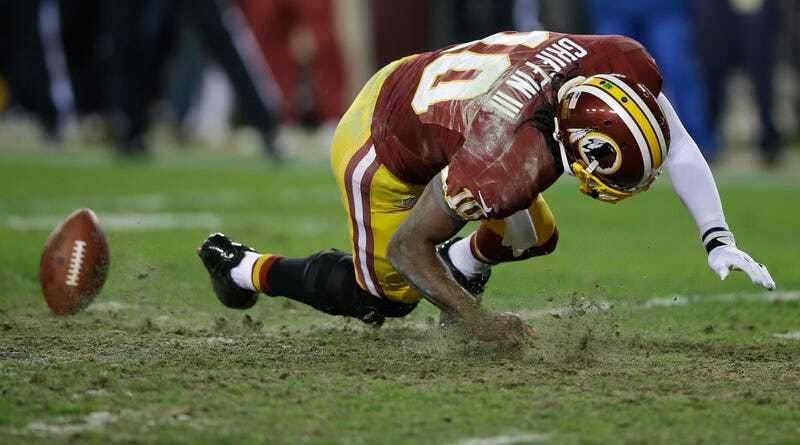 The grass at FedEx Field has been a joke for a long time (Tifway 419 Bermudagrass, if you're curious). 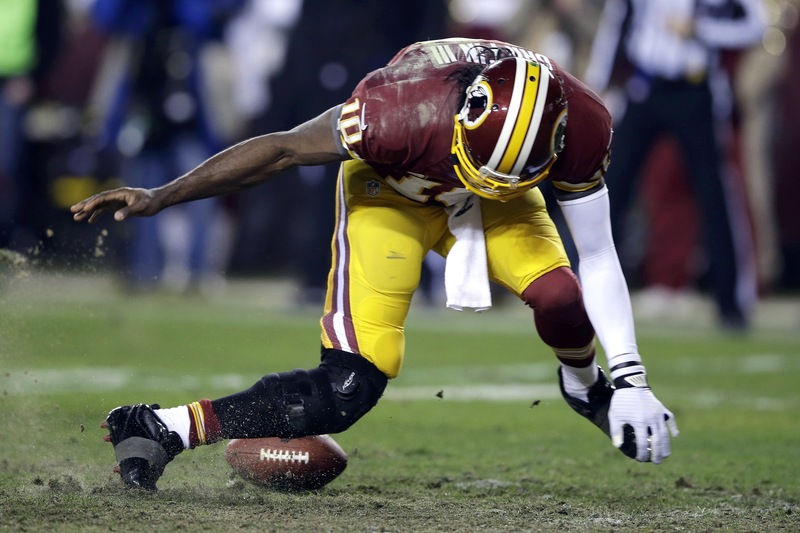 It's a wonder the NFL, so concerned these days with player safety, hasn't spoken to the Redskins about their field. It's not as if there's not precedent: in 2006, the NFL compelled New England to re-sod Gillette Stadium because the grass was so atrocious. A month later, the Patriots just replaced the whole thing with FieldTurf. Will Roger Goodell lean on Dan Snyder to make changes before the start of next season? Will Snyder open his wallet voluntarily? Or will the Redskins, who mortgaged the future on a player who needs to cut and deke and maintain his footing, abandon him to the elements? Griffin, in between answering questions about his health and his coach's decision to leave him in the game, had time for a brief word on the FedEx grass. Just try to read it without getting sad. "That's just part of our home-field advantage."